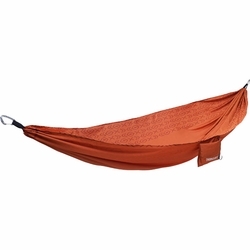 Therm-a-Rest Slacker Single Hammock. Slack off in style with a uniquely soft polyester fabric that feels great next to your skin and offers a subtle, yet functional stretch that eliminates the pressure points of nylon. It stuffs into its own attached pocket that doubles as a place to stash a book or tablet, right before you nod off for your Saturday siesta. Available in both single and double sizes.